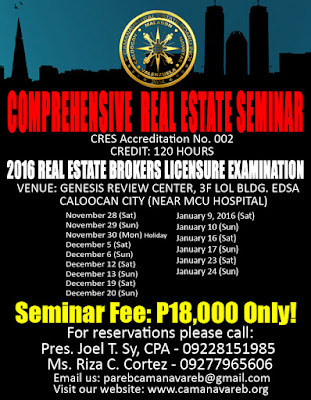 Attend the 120 Hours of Comprehensive Real Estate Seminar (CRES) for Real Estate Broker to be conducted by PAREB-Caloocan Malabon Navotas Valenzuela Real Estate Board, Inc. It will be held at GENESIS Review Center, 3rd Flr. LOL Building, EDSA, Caloocan City. The said seminar is for the scheduled February 28, 2016 PRC licensure examination. RA 9646 or the Real Estate Service Act of 2009 (RESA) regulate the practice of real estate service in the Philippines. 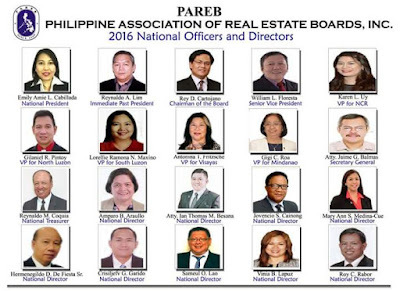 PAREB-CAMANAVAREB offers early bird rate promo of P16,500.00 until November 10, 2015 only and accepts cash online payment via bank deposit, pay pal or local credit or debit card*.